Michelle Zeibots is a transport planner, specialising in the analysis of sustainable urban passenger transport systems. Her research, consultancy work and teaching draws together operational, behavioural and governance features relating to multi-modal urban transport networks. Michelle has a continuing split appointment at UTS between the Institute for Sustainable Futures where she is a Research Director responsible for strategic oversight within the transport area, and a Senior Lecturer in the Faculty of Engineering & Information Technology in the School of Civil Engineering where she lectures in transportation engineering. 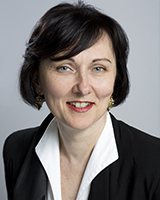 Michelle is also the Reserach Director for the UTS Transport Reserach Centre, a multi-displinary, cross-faculty reserach hub within UTS dedicated to applied transport research, teaching and learning programs within a customer service paradigm. Michelle combines her knowledge of more sustainable public and active (walking and cycling) transport models as a means of reducing road traffic congestion through her specialisation in induced traffic growth, having completed a PhD at ISF/UTS on urban motorway development, induced traffic growth and its implications for sustainable urban development. Michelle has since acted as an expert witness and expert referee, carried out empirical analysis and joint-authored reports for several Australian State and New Zealand Government agencies on this aspect of transport science. Michelle is regularly approached by television, newsprint and radio journalists to comment on transport policy and projects in NSW and other Australian states. She has been interviewed by high profile media interviewers and is often asked by journalists to explain technical concepts and assist them with background information on stories. She has a particular gift for translating technical concepts into relatable language and stories. She is mindful of the political context in which public discussion takes place — another reason journalists like to work with her — and this has enabled her to assist communities and local governments to make a case for sustainable active and public transport projects. © 2018 Mina Ghanbarikarekani et al. Urban intersections have been well recognized as bottlenecks of urban transport systems. It is thus important to propose and implement strategies for increasing the efficiency of public and private transportation systems as a whole. In order to achieve this goal, an additional signal could be set up near the intersection to give priority to buses through stopping vehicles in advance of the main intersection as a presignal. It has been increasingly popular in urban cities. While presignals indeed reduce the average delay per traveler, they cause extra stops of private vehicles, which might compromise the overall efficiency, safety, and sustainability. This paper aims to propose a model to improve presignals by reducing the vehicles' number of stops behind the presignals. By applying the method, vehicles would be able to adjust their speed based on traffic conditions as well as buses' speed and approach. Numerical analyses have been conducted to determine the conditions required for implementing this method. Zeibots, M.E. 2010, 'The travel plan revolution? ', Indesign, vol. 43, pp. 226-227. This article examines the implications of peak oil on the physical and money systems of the Australian economy, describinghow over-reliance on private motor vehicles can expose the economy to the risks of demand destruction. travel time longer and pose some challenges when bottlenecks appear at entry. affects the duration and severity of the congested period. Al-widyan, FS, Kirchner, N & Zeibots, M 2015, 'An empirically verified Passenger Route Selection Model based on the principle of least effort for monitoring and predicting passenger walking paths through congested rail station environments', Australasian Transport Research Forum 2015 Proceedings, Australasian Transport Research Forum, ATRF, Sydney, Australia. confined public transport environments such as rail station concourse and platform areas. quality inputs on which passenger behaviour models can be based. Kirchner, NG, Caraian, S, Colborne-Veel, P & Zeibots, M 2015, 'Influencing Passenger Egress to Reduce Congestion at Rail Stations', Online Proceedings of the Australasian Transport Research Forum 2015, Australasian Transport Research Forum, ATRF, Sydney, Australia. As rail station patronage levels increase, so too does the load on the entire railway system. study which was co-located at Perth Station Perth and the University of Technology Sydney. potentially be leveraged to benefit operations. The paper examines the difference between the attitudes of decision makers and the general community in relation to transport development and finds that decision makers believe the general community want more roads built whereas surveys show the majority of people in the general community would prefer to see more investment in public transport. The paper then examines actual travel behaviour responses to the opening of new roads, exploring a phenomenon known as induced traffic growth, noting that the increase in traffic volumes that occurs is due to changes in travel speeds. The paper concludes that people respond to changes in travel time and that speeds can also be increased on public transport. This is a decision arising from the transport decision making process however and not the actions of individuals who simply respond positively to increases in speed, irrespective of the mode. Baumann, C. & Zeibots, M.E. 2010, 'Urban transport systems and their place in macroeconomic conceptions of sustainability', Proceedings of the 3rd Kuhmo-Nectar Transport Economics Conference, 3rd Kuhmo-Nectar Transport Economics Conference, University of Valencia of Spain, Valencia, Spain. This paper attempts to provide a definition of sustainable urban transport development. As will be shown, while the need to develop transport in a sustainable way has been widely accepted by many governments and transport practitioners, a consistent view on what is meant by sustainable transport is yet to develop. In an effort to address this, this paper begins by providing a systematic overview of the problems that the urban transport sector faces. It highlights shortcomings in the traditional ways that transport practitioners have approached the issue of sustainable transport development. In response, it proposes a different way of conceptualising the role of urban transport as a provider of access to services and facilitator of interaction and exchange in the urban system. In so doing it provides a new understanding and definition of what sustainable transport development could be in practice. This paper examines the relationship between the addition of urban motorway capacity and declines in rail passenger journeys on parallel alignments. The research presented here forms part of a wider study that investigates outcomes from the expansion of urban motorway capacity in Sydney and the phenomenon of induced traffic growth. I nduced traffic growth is defined as new and additional road traffic movements that occur in response to increases in road capacity. By increasing road capacity, congestion and travel times are reduced, making travel by car more attractive. This generates a rapid succession of changes in travel behaviour across the surrounding network including traffic reassignment, traffic redistribution, generated traffic and passengers switching from parallel rail and public transport services, or mode shifting. This last response is the focus of this paper. Together, all form part of the composite effect called induced traffic growth (SACTRA 1994, p.53). The effects of mode shifting and other travel behaviour responses are significant because they potentially undermine the primary benefit of supplying additional urban motorway capacity which is to reduce travel times (Thomson 1977; Downs 1992; Mogridge 1997). If road traffic volumes increase, travel time savings are quickly eroded and congestion returns. If public transport patronage falls and services sustain revenue losses, service levels may be cut, imposing additional costs on public transport users and operators (SACTRA 1994, pp.128129). Investigating responses to urban motorway development, such as mode shifting, is therefore important as it assists in gauging whether or not additional motorway capacity has been an effective policy response for reducing congestion. Most planning and evaluation tools are derived from a theory that attempts to describe how the system in question works. The tools currently used to assess the relative merits of urban transport options are based on the logic of mainstream economic theory. But this theory is essentially a-spatial and therefore poor at describing all the changes that take place in an urban system once a new motorway or public transport link is opened. This paper investigates the way two different theories can be used to explain the phenomenon known as induced traffic growth - the sharp increase in road traffic that occurs after the opening of a new urban motorway. First, an explanation using standard supply and demand theory is used to explain the cause and consequences of the effect. Then, General Systems Theory is used to explain the same process. The first explanation renders the outcome in a way that is physically abstract, providing a number value. The second articulates the outcome using spatial data, illustrating both positive and negative changes to land use sectors and patronage on more sustainable transport modes. It is argued that the latter method provides greater insights into the real consequences of motorway building and induced traffic growth, and with it the basis for more useful transport planning and evaluation tools. The challenge for regional government is to recognize the shortcomings of current evaluation methods and reform them so that economic and environmental outcomes are more sustainable. This paper seeks to demonstrate the need for that reform and the direction it might take. Zeibots, M.E. 2002, 'The macroeconomic structure of cities: indicators for sustainable urban infrastructure development', Regional Cycles: Regional Economy Towards Sustainability, Regional Cycles: Regional Economy Towards Sustainability, Leipzig, Germany, pp. 1-10. Zeibots, M.E., Brennan, T. & Rickwood, P. Institute for Sustainable Futures, UTS 2011, Rhodes West Travel Plan (preliminary investigation), Sydney. Mason, L.M., Boyle, T.M., Brennan, T. & Zeibots, M.E. Institute for Sustainable Futures, UTS 2011, Travel and Access Guide for residents at Rhodes Peninsula, Sydney. Zeibots, M.E. & Brennan, T. Institute for Sustainable Futures, UTS 2011, Implications of induced traffic reduction for the implementation of dedicated bus lanes on Hoddle Street and Victoria Parade, Melbourne, Sydney. Zeibots, M.E. Institute for Sustainable Futures, UTS 2009, Expert witness report to the Frankston Bypass Panel: supplementary report, Sydney, Australia. Responsive Transport Environments: Spatial and Visual User Information Technologies to Allow Improved Passenger Flow and a Better Customer Experience.